in the Egyptian taste, consisting of two substantial green glass beetles backed with silver foil and mounted in yellow gold, secured by thorn like claws decorated with opaque black enamel, suspending eight staggered rows of translucent green glass beads leading to two further moulded glass beetles suspended in the centre. R LALIQUE, 40 Cours-La-Reine, Paris. René Lalique’s first experiments in glass date from 1890 when he moved into premises in the rue Thérèse on the corner of the Avenue de l’Opéra and had workshops installed there to his specifications. By the time he moved to 49 Cours la Reine in 1902, the vast double doors leading into his building were composed entirely of glass created to his design and under his auspices. ‘Lalique: Schmuck und Objets d’art 1890-1910’ by Sigrid Barten (Munich, 1989) page 102, and catalogued as number 378. 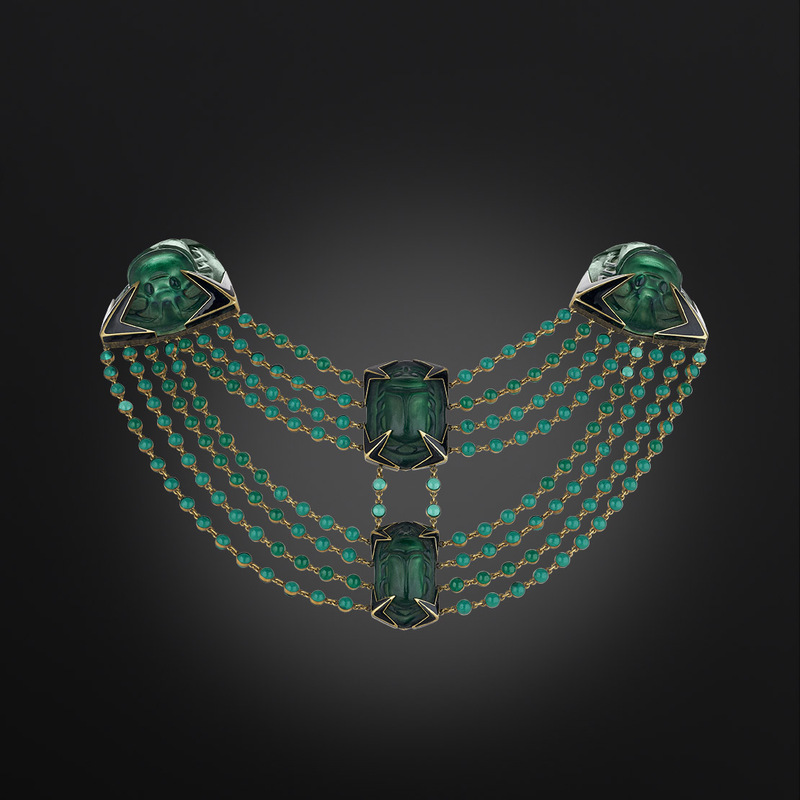 According to Barten, one of the first jewels by Lalique incorporating glass that he deemed worthy of his collectors was acquired by Calouste Gulbenkian in 1901, and dates from c.1898-1900. It consists of a pendant in which silver poppies frame a female portrait composed of the material. The scale of this particular necklace and of the glass plaques it incorporates is unparalleled. Only one jewel, located in the Walters Art Gallery and described as a ‘Glass grape necklace’, contains glass elements of substantial size but still inferior to those in this jewel, which measure 7.1 cm x 4.6 cm at their widest point.The piece would have have been secured with a ribbon and could have been worn over the forehead as a head ornament, as well as a necklace. The shimmering quality of insect wings, akin to that produced by gemstones, did not escape the leading exponents of the decorative arts, who featured them in their work. Jewellers began incorporating irridescent beetles’ wings into their creations in the 1860’s, and Ellen Terry, playing Lady Macbeth in 1889, wore for the role an extraordinary gown shimmering with the wings of 1000 green beetles. Its design was inspired by a dress worn by Lady Randolph Churchill also trimmed with beetles’ wings. 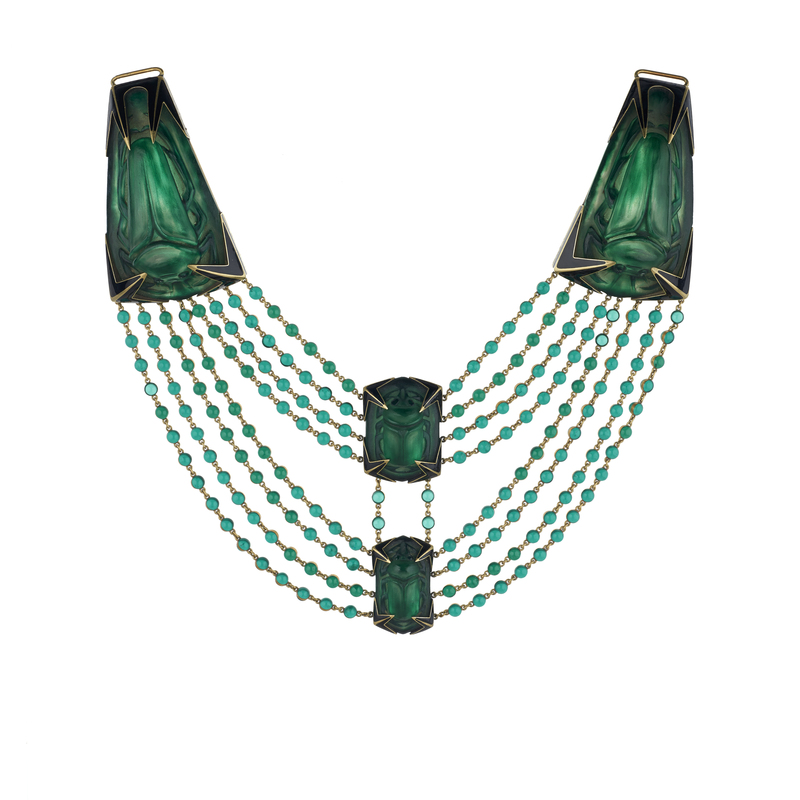 In his necklace, René Lalique has successfully reproduced this luminous effect with substantial sections of green foiled glass that perfectly match the green glass beads that are suspended from them.